Back to ‘Immigration Statistics, year ending December 2018’ content page. Data relate to year ending December 2018 and all comparisons are with the year ending December 2017, unless indicated otherwise. The Home Office provides a more detailed commentary on an annual basis. The latest detailed annual commentary is included in ‘Immigration statistics, year ending June 2018’. The total number of work-related visas granted (including dependants) in 2018 increased by 7% (or 11,183) to 176,126. This was primarily due to a 9% (or 8,488) increase Tier 2 (Skilled) work visas to 102,653. This category accounts for the majority (58%) of work-related visas granted. The total number of work visas granted was the highest level since the year ending March 2009, around the period when the points based system (PBS) for work was rolled out. The vast majority (95%) of work-related visas are granted. Tier 2 (Skilled) work visas had a grant rate of 98%, and Tier 5 (Youth mobility and temporary workers) had a grant rate of 95%. The ‘Non-PBS / Other’ category includes routes such as domestic workers in private households, and UK Ancestry visas. There were increases in visas granted in the ‘Tier 2 – General’ route (up 4,443 to 24,416), and in sponsored visas applications in the ‘Human health and social work activities’ sector’ resulting from the removal of highly skilled doctors and nurses from the Tier 2 visa cap. Visas issued to dependants of Tier 2 visa holders also saw a notable increase (up 5,117 to 45,873). Indian nationals (who account for 54% of all Tier 2 visas granted) saw the largest increase in grants up 3,023 (or 6%) compared to the previous year. There were also notable increases in Tier 2 grants to nationals of Nigeria (up 1,331) and the Philippines (up 1,053). ‘Tier 1 (closed)’ includes the ‘Tier 1 – General’, and ‘Tier 1 – Post study’ categories. These categories were closed to new entrants following operational evidence that these routes were not working as intended. These routes are not included in the ‘Tier 1 (High value)’ category in the chart. Non-PBS visas are not included on the chart. In 2018, there were 58,399 certificates of sponsorship applications for Tier 2 (Skilled) work, an increase of 3,741. This included a 3,545 (54%) increase in applications in the Human health and social work activities sector to 10,108, which is likely related to the removal of doctors and nurses from the Tier 2 cap. The long-term reduction in the number of Tier 1 visas granted reflects the closure of the Tier 1 General route in December 2010, which changed the route from an open points-based route to one focused on high-value migrants only. In the latest year, there was a 20% increase in the number of Tier 1 visas granted, up 1,011 to 6,111. This was partly driven by a 27% increase for dependants of ‘Tier 1 – Entrepreneurs’, up 414 to 1,945. The number of Tier 5 (Youth mobility and temporary worker) visas granted increased by 745 (or 2%) to 41,520. 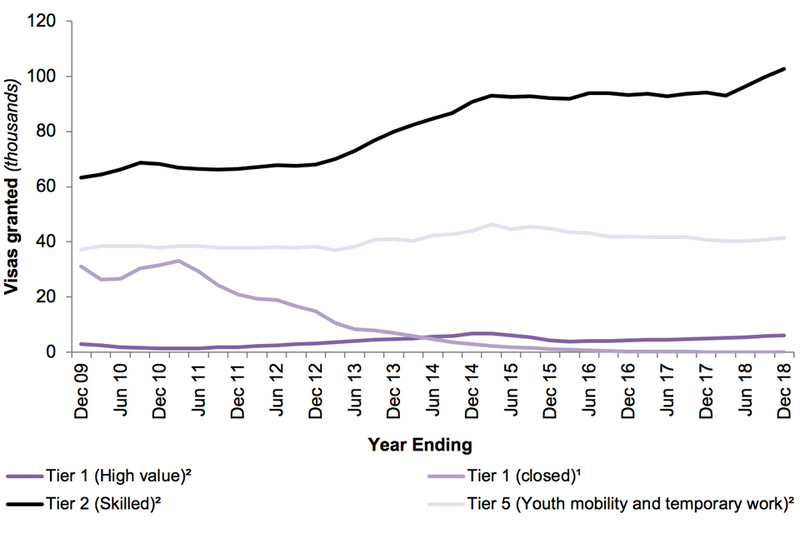 Around half the Tier 5 visas granted are accounted for by the Youth mobility route, although the number on this route fell by 681 in the most recent year to 20,876. The increase in Tier 5 was mainly driven by an increase in grants in the ‘Tier 5 – Creative and sporting’ route (up 628 to 7,592) and ‘Tier 5 – Government authorised exchange’ route (up 448 to 6,825). The statistics in this section provide an indication of the number of people who have an intention to enter the UK for work reasons. This includes both highly-skilled non-EEA workers, investors and entrepreneurs, temporary workers, and those employed in sports, the arts and other sectors. Entry clearance visas allow an individual to enter and stay in the UK within the period for which the visa is valid. EEA nationals do not require a visa to enter the UK. Data in this section refer to the number of Entry clearance visas granted for work reasons within the period. If an individual is granted a visa more than once in a given period, this will be counted as multiple grants in the statistics. If an individual enters the UK multiple times within the period for which a visa is valid, this will be counted as one grant in the visa statistics. The data do not show whether, or when, an individual arrived in the UK, what they did on arrival to the UK, or how long they stayed in the UK. Year-on-year comparisons of the number of decisions can be affected by quarterly fluctuations in the data. Such fluctuations can be examined in more detail in the quarterly data that are available in the published tables. Tier 1 of the PBS was phased in between February and June 2008 as a general route. However, from 2010, Tier 1 has focused on providing visas for ‘high-value’ migrants only, including the exceptional talent route, investors and entrepreneurs. Tier 2 of the PBS is the primary route for economic migration to the UK. Broadly, the route is for skilled workers from outside the EEA who have an offer of employment in the UK in an occupation classed as skilled to NQF6 or above. Tier 2 was implemented in November 2008. There are four routes within Tier 2 – General, Intra-company transfer, Minister of religion and Sportsperson. Tier 5, which is for Youth mobility and temporary workers, providing a route for those coming to the UK for primarily non-economic reasons, was implemented in November 2008. Applicants for visas (and extensions) for Tier 2 (Skilled) work and for Tier 5 (Youth mobility and temporary worker) must obtain a certificate of sponsorship (CoS) from a registered employer. Any organisation that wishes to sponsor a worker must be registered on the Home Office’s Register of Sponsors. Tier 2 (General) is currently subject to a cap on the number of CoS that can be allocated to employers for newly hired employees earning less than £159,600 per year, or for dependants of Tier 4 Students who wish to switch into Tier 2 ‘General’ category. The sponsor must apply for an allocation for these ‘restricted’ CoS on a case-by-case basis to be considered at a monthly allocation meeting held by the Home Office. Details of the outcome of the monthly allocation process are published by UK Visas and Immigration (UKVI). On 15 June 2018, the government announced that doctors and nurses are to be excluded from the cap on skilled worker visas. Further information about the CoS allocation process is given in the user guide and on the UK visa sponsorship for employers section of GOV.UK. The Office for National Statistics (ONS) publishes long-term international migration (LTIM) estimates in its ‘Migration Statistics Quarterly report’. The report includes estimates from the International Passenger Survey (IPS) on the number of people coming to the UK with the intention of staying for 12 months or more for work, study, family and other reasons. Estimates are available for EU, non-EU, and British nationals. IPS data are not directly comparable with Home Office visa data for a number of reasons. See the ONS article ‘Comparing sources of international migration statistics’ for details. If you have any comments, or suggestions for the development of this report, please provide feedback by emailing MigrationStatsEnquiries@homeoffice.gov.uk. Please include the words ‘PUBLICATION FEEDBACK’ in the subject of your email. See section 7 of the ‘About this release’ section for more details.